This room is within the turret on the second floor. 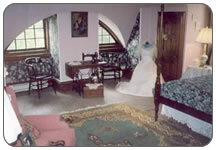 The room consists of a main bedroom with an adjoining dressing room. 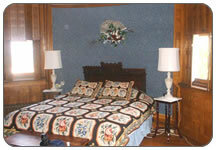 The bedroom contains original shuttered windows, and ceiling fan. An adjoining sitting room has stained glass. The original soaking tub remains in the bathroom. Click here for pictures and details . 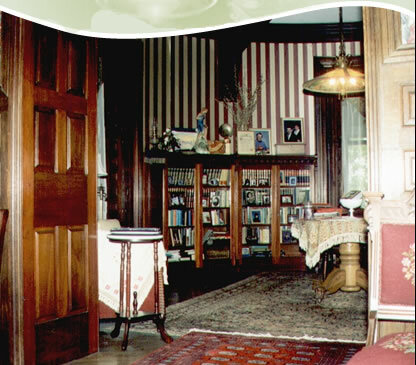 . .
Mr. Edward Brooke's Room is across the hall on the second floor. 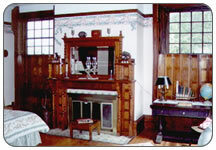 A spacious room with ornate woodwork. Relax in the claw foot tub. Private bath offers original nickel-plated fixtures. This room is in a much darker wood. Yes, in the Victorian era husbands and wives slept in different rooms. Everything is original as far as woodwork, and fireplace. Cornelia's Room is on the third floor. This room boasts lots of nooks and crannies, original floor and window shutters, and a private bath with claw foot tub and shower. This room is named after a still living daughter-in-law, who was the wife of Edward Brooke’s son, George.